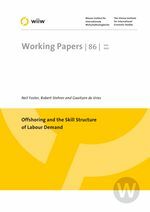 In this paper we examine the link between international outsourcing – or offshoring – and the skill structure of labour demand for a sample of 40 countries over the period 1995 2009. The paper uses data from the recently compiled World-Input-Output-Database (WIOD) to estimate a system of variable factor demand equations. These data allow us to exploit both a cross-country and cross-industry dimension and split employment into three skill categories. Our results indicate that while offshoring has impacted negatively upon all skill levels, the largest impacts have been observed for medium-skilled (and to a lesser extent high-skilled) workers. Such results are consistent with recent evidence indicating that medium-skilled workers have suffered to a greater extent than other skill types in recent years.